Have you ever made ice cream without an ice cream machine? Many people think that this ice cream doesn’t taste great, but it’s super creamy and delicious and very easy to make! You will need only 2 ingredients! I make this homemade ice cream every week and my family loves it very much! Here are 6 steps to make ice cream without an ice cream machine! As I said, you will need only 2 ingredients in order to make homemade ice cream! Seriously, ladies, no more churning or ice cream machine necessary! You will need one 14 ounce can of sweetened condensed milk and 2 cups of heavy cream. Now it’s time to gather the materials! You will need 2 bowls, a spatula, a mixer, a whisk, and a storage container. Good beginning, isn’t it?! While you are in the grocery store, you can choose some ice cream toppings to make your homemade ice cream even more delicious! In fact, you can incorporate many ingredients into your ice cream, ranging from cookie dough to sprinkles to nuts or fruit! Just get creative and try different recipes! There are many amazing homemade ice cream flavor recipes, so check them out and try a few of them! Pour 2 cups of heavy cream into your bowl and whip until stiff peaks form. I usually use a mixer on low to make the stiff peaks, but you can whip the heavy cream by using a fork, but I don’t like it because it’s a lot of work! However, don’t whip the cream too much; otherwise your mixture can turn into butter! And you certainly don’t want that, right?! Now, take another bowl and pour the sweetened condensed milk into it. Add in any of your desired ingredients, such as toppings or flavorings! Since I’m a very big chocolate lover I’d add in chocolate chips and cookie dough! 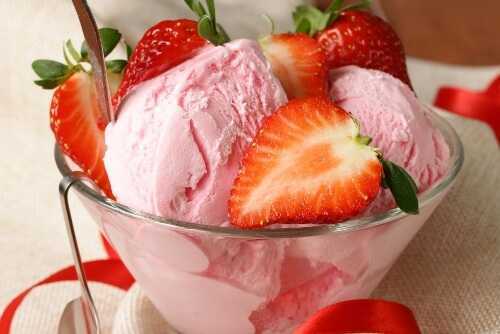 If you love fruits or nuts, feel free to add them in your ice cream! Using a spatula gently fold the whipped cream into your condensed milk mixture. Be sure to fold it in well! You should have an even mixture. Moreover, be careful not to spill your mixture, because it is terribly sticky to clean up, trust me I know! Finally, store your mixture in a storage container and leave the ice-cream in the freezer for a final freeze, until it’s solid. Scoop the hardened ice cream into a waffle cone and add some whipped cream and a strawberry to top it off! Sounds yummy, right? Have you ever made ice cream without machine? If you haven’t, are you going to try to make some? Do you know any homemade ice-cream recipes? Share them, please! I want to try something new!